“Wayne Art Center is very proud to announce the 23rd celebration of Craft Forms. Craft Forms 2017, the International Juried Exhibition of Contemporary Crafts, will be on display at Wayne Art Center from December 8, 2017 – January 27, 2018. This eagerly anticipated exhibition is dedicated to enhancing the public’s awareness of fine contemporary craft while providing a venue for established and emerging artists to share their creative endeavors. Craft Forms is internationally recognized as one of the premier contemporary craft exhibitions. The finest works of ceramics, wood, fiber, metal, glass, mixed medium, and 3D printing are featured, supporting the center’s mission of expanding the public’s awareness of fine contemporary crafts and significantly benefiting all educational and outreach programs for children and adults. One of the highest museum-quality craft exhibitions in the United States, Craft Forms consistently draws upward of 5,000 visitors during its two-month exhibition. More than 250 guests, including art collectors, supporters of Wayne Art Center, and the Craft Forms 2017 juror and artists, will celebrate the opening of this annual exhibition and companion show at the Craft Forms Preview Party on Friday, December 8, from 6 to 10 pm. The exhibitions and special events continue to attract local, regional, national, and international visitors throughout the duration of the show. Craft Forms’ status as a fine craft exhibition grows each year in large part due to the expertise of the acclaimed jurors. Wayne Art Center is pleased to welcome Nora Atkinson, the Lloyd Herman Curator of Craft of the Renwick Gallery at the Smithsonian American Art Museum, as this year’s Craft Forms Juror. A seasoned curator, published writer, and respected lecturer, Ms. Atkinson will select a collection of approximately 100 pieces of artwork from 429 artists and 780 artwork submissions representing metal, glass, ceramics, fiber, wood, digital, and mixed media by artists from throughout the world. “We are honored to have Nora Atkinson’s involvement this year. Her endorsement is greatly valued by all of those involved in the execution of this highly-anticipated exhibition that celebrates the diversity of so many talented contemporary craft artists around the world,” commented Nancy Campbell, Executive Director and founder of Craft Forms. Wayne Art Center is equally excited to present this year’s companion show, Breaking the Glass Ceiling: Women in Glass, curated by Dr. Arlene Silvers. A glass educator and collector extraordinaire, Silvers is best known for her glass curatorial efforts with the National Liberty Museum in Center City. 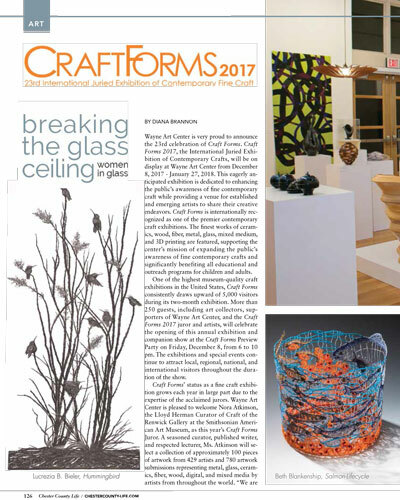 Breaking the Glass Ceiling: Women in Glass will run concurrently with Craft Forms and will feature approximately 100 works by over 20 invitational glass artists. The exhibi – tion will survey female glass artists, from the “Grand Dames” of the ‘70s to the “Young Turks” of the 21st century, and will show many achievements of women working with glass, from the male-dominated Studio Glass Movement of the ‘60s to the present. In addition, Vidinghoff Gallery will feature Patrick Lee’s Excursions that will explore pushing the painting abstraction in his work through color, shapes, and drawings. The Ethel Sergeant Clark Smith Outer Gallery will highlight Wayne Art Center faculty member Val Rossman and her students in a show of abstracted paintings.